Cloud Computing provides a highly elastic environment that enables on-demand infrastructure capabilities over the internet to scalable computing resources (networks, servers, storage, applications, and services) that can be deployed quickly with cost efficiency and minimal management effort. 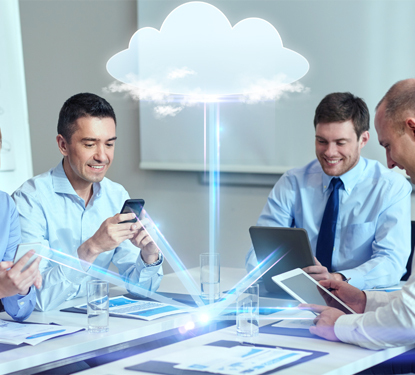 According Gartner report – Cloud is changing the way applications are designed, tested and deployed, resulting it a significant shift in Application Development priorities. Cost is major driver, but also agility, flexibility and speed to deploy new applications. Glocal Assist provides a wide array of cloud computing services that empowers organization to transform their business & leverage IT. We use a highly structured approach that is centered on building & providing competency based services such as Cloud Assessment, Implementation & Migration to Private, Public and Hybrid Clouds and Cloud Operations services. Growth in the enterprise application software market is being driven by cloud-based software-as-a-service (SaaS) offerings, and will soon reach $150 billion in annual revenues, according to new research from Gartner Inc.
Software as a Service (SaaS) is a cloud model that delivers on-demand applications that are paid for on a subscription basis. Our SaaS solutions offer a number of advantages over on-premises deployments, including minimal administration and maintenance, anywhere access, and in many cases improved communication and collaboration. Cloud platform services, or Platform as a Service (PaaS), are used for applications, and other development, while providing cloud components to software. Through PaaS we offer a computing platform that allows the creation of web applications quickly and easily and without the complexity of buying and maintaining the software and infrastructure underneath it. Cost Reduction : standardized and consolidated resources, fewer database elements, reduced operating expenditures. Agility : rapidly deployment of environments for development, testing and production. Reducing Complexity : easier to manage and more reliable environment. Cloud infrastructure services, known as Infrastructure as a Service (IaaS), are self-service models for accessing, monitoring, and managing remote data center infrastructures, such as compute (virtualized or bare mental), storage, networking, and networking services (e.g. firewalls). Our Infrastructure as a Service (IaaS) model allows organizations to outsource computing equipment and resources such as servers, storage, networking as well as services, such as load balancing and content delivery networks. Instead of having to purchase hardware outright, we offer “pay – as – you – go” wherein users can purchase IaaS based on consumption, similar to electricity or other utility billing.